How does the best athletic tape, Ooblock™ crush old-school athletic tape? Ooblock™ is bonded with Shear Thickening Fluid (STF™)—a substance that’s a cross between liquid and solid. At rest, STF™ nano-particles float freely, remaining flexible. But with force—like sudden twists or impacts—STF™ nano-particles lock together in hydroclusters, forming a stiff molecular wall that disperses force and braces the impact zone. The greater the force on your Ooblock™-taped joint—the stronger the brace-like protection. And the hydroclusters disperse within a millisecond—so no flexibility is lost, but the protective reaction is always ready for the next play. 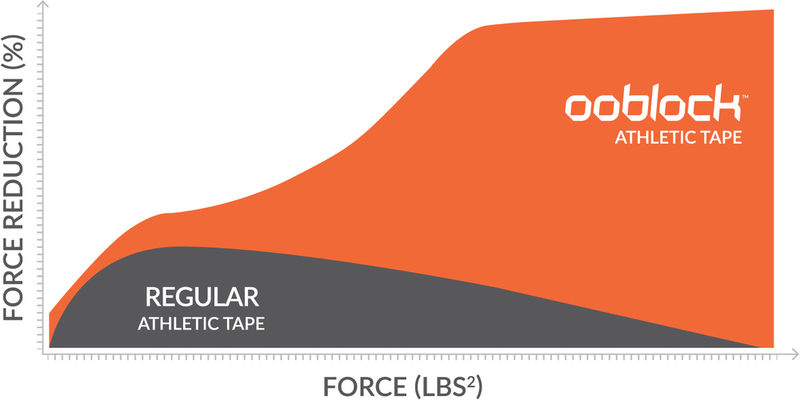 Ooblock™ Athletic Tape reduces impact like regular tape for small forces. But as forces increase in intensity, regular tape becomes ineffective. Conversely, Ooblock™ dramatically multiplies in effectiveness as the hits get harder. Third party testing shows the anti-vibration properties of Ooblock™ Athletic Tape compared to standard tape. Ooblock™ shock protection performs 2X better on average. Less shock means increased stability for taped joints. Kevlar® treated with Shear Thickening Fluid (STF™) can stop bullets up to 3.5X more effectively than plain Kevlar®. This edition features a story on the new advancement in lightweight body armor is the result of research that Army and University of Delaware scientists began more than a decade ago. Ooblock™ is an innovative, scientifically grounded and combat-tough tool for athletes to prevent joint injuries and ankle sprains. Try it for yourself. Still have questions? Check out the FAQ.